supported everything the residents stated are on this website. And when you read it you'll think, you could not make this up! OVER SIX THOUSAND HITS - WOW ! We have been contacted by a number residents who said that Firmus were not responsible for damaging pipes beside their homes, and that the problems with the drains has been going on since last year. We are looking into this and hope to find out the responsible party so that they can be held accountable. It’s amazing how positions can change. 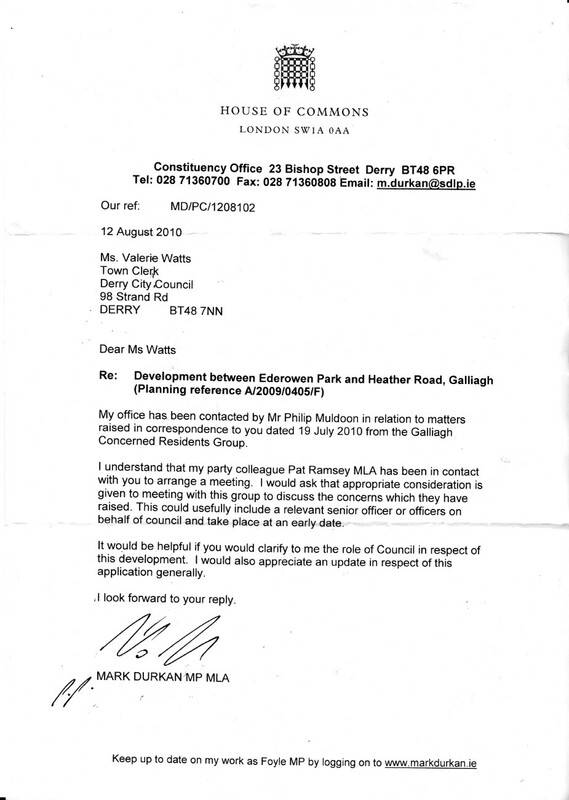 On the 1st September 2009 when Pauline Mellon addressed Derry City Council planning committee, the proposed development at Heather Road in Galliagh was, according to more than one Derry City Councillor at the meeting a Council project. When residents returned to Council to the environmental services committee at the start of November 09 we were told on multiple occasions by the city solicitor Damien McMahon that this was not a Derry City Council project, they had merely provided ‘technical assistance’. In a letter from Derry City Council Town Clerk Valerie Watts to resident’s legal agent John Thompson of the Community Planning Initiative on 5th of November 2009, Ms Watts not once but twice stated that 'this was not a council project'. Bear those two points in mind for a minute. In the 18 month since this all kicked off with residents being told what was good for them by the self styled Galliagh Development Trust. Then denied proper consultation by Derry City Council, told conflicting stories by different agencies, excluded from meetings about their community all dished up with healthy servings of disdain and contempt. Derry City Council said that they were not the project promoter, yet the Department for Social Development who gave ¼ million pounds to Council for the project said that Derry City Council was the promoter! Councillors refused to answer questions, or indeed instruct Council officers to answer questions and so on and so forth. Confused? Well that was the tip of the iceberg! Flash forward to 18th January 2011 and John Thompson of the Community Planning Initiative receives another letter from Derry City Council’s now outgoing Town Clerk Valerie Watts. Council has once again changed its tune. There has been a paradigm shift within the lofty towers of 98 Strand Road – that’s the Derry City Council Offices to us mere mortals! Derry City Council now states it worked in 'partnership' with the Northern Ireland Housing Executive, The Department for Social Development and the Outer North Neighbourhood Partnership. That’s a world away from merely providing ‘technical assistance’, but it gets better. Derry City Council now takes ‘OWNERSHIP AND LIABILITY FOR THE PLAY PARK, its OPERATION AND IT’S MANAGEMENT. Yes you did read that correct, talk about a 180 degree turn! A few interesting points to consider. Why no mention of the Galliagh Development Trust as part of the ‘partnership’? If at the root of all this it had nothing to do with them, then on whose authority were they operating? What is the Galliagh Development trust funded to do? And even more glaring of all why did Council not declare that they were in a partnership. Why were both the Town Clerk and City Solicitor purposefully releasing information that was at best incorrect? Or was it the case that these two senior council officials really do not know their arse from their elbow? So even though we finally have a victory for common sense, albeit begrudged, this declaration does not absolve Council nor it officers of their poor performance and mismanagement of the situation. Nor does it negate the fact that had people not stood and said a resounding ‘STOP’ then Council would have ridden roughshod over the community. But it does show that communities do need to stand up for themselves and to keep asking the questions that need asked leaving no stone unturned along the way. Derry city council are now in the process of handing the land they they have not developed back to NIHE ownership. Pauline Mellon of the residents group has written to the NIHE board of directors asking that they consider creating two protocols that will ensure that a similar situation does not arise again, in Derry or anywhere else. We hope that NIHE adopt Pauline's reccomendations. STILL NO RESPONSE FROM THE ONNP IT'S MID FEB AND THEY STILL REFUSE TO STATE THEIR ALLEGATIONS. 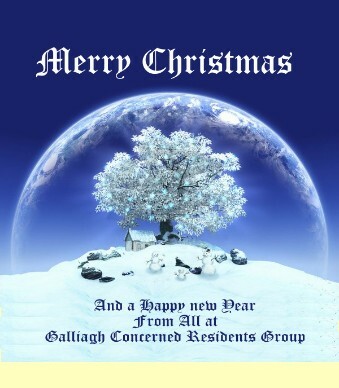 NEW UPDATES 17th Dec - Scroll down for Galliagh News & Festive fun with the ONNP. We have also just had our 1000th friend join us on facebook- Thank You All!! 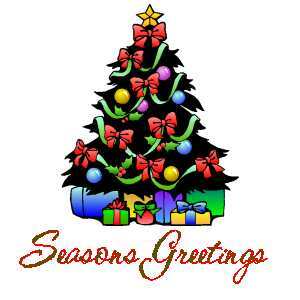 We would like to take this opportunity to wish everyone a Merry Christmas and a fantatstic New Year. 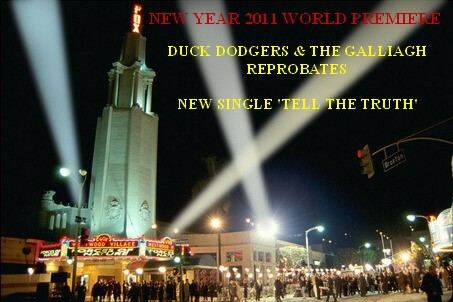 We hope that 2011 brings many positive things to your life. 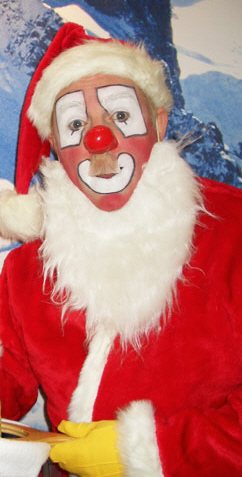 We would also like to ask that during the Christmas period you spare a thought for someone less fortunate than yourself. if you're going to the shops, think is there a friend or neighbour who would have difficulty in getting out and about due to the weather or maybe through illness. You gotta love the Outer North Neighbourhood Partnership, just when you thought you'd stopped laughing they set us off once more, but at the core of all this are some pretty serious issues. At a meeting of their board, it was stated by members of the ONNP that residents from Galliagh when they addressed Derry City Council had made further accusations. What these further accusations ammounted to or indeed what the original accusations were that this group was supposed to have made are anyone's guess. So we wrote to the DSD and asked them, they're a government body, would their representative on the ONNP like to clarify what these accusation were and and what the original accusations were. This persons only recollection of the discussion was that someone said further accusations were made. WE HAVE NEVER MADE ACCUSATIONS ABOUT ANYONE, WE HAVE STATED FACTS. WE HAVE TIME AND TIME AGAIN PRODUCED THE DOCUMENTS TO SUBSTANTIATE EVERYTHING WE HAVE STATED. So we have written to the ONNP and asked them for the detail of any accusations we are supposed to have made. For the benefit of the ONNP a dictionary definition of an accusation is: 'A charge of wrongdoing that is made against a person or other party'. So to the ONNP - PUT UP OR SHUT UP! Detail any accusations we have made, if we are wrong then PROVE US WRONG. And if we are wrong, we will apologise, we will as we have always stated - correct any error or omission. The Question is will the ONNP do the same? And on the subject of the ONNP, the ONNP at their September meeting questioned the keenness of the DSD in providing information to us under the freedom of information legislation. Now this is a legal responsibility that statutory groups must adhere to. So what did the ONNP do? Their strategy manager Darren Kirby got legal advice from a solicitor about the DSD obeying the law. Now the question is why are the Outer North getting advice from a solicitor on a matter which has nothing to do with them, that being the legal obligation of the DSD to fulfil requests in accordance with statute. And considering that this solicitor gave them advice that completely contradicts what is laid down by law, we would as gesture of good faith like to say to the ONNP that we can put them in touch with someone who can give them accurate legal advice if they require it, all they have to do is ask. Anyway as usual we've uploaded the original documents so that we can't be accused of making accusations, as we said earlier, we deal in facts. Click here to see the minutes of the meeting between the DSD & ONNP. 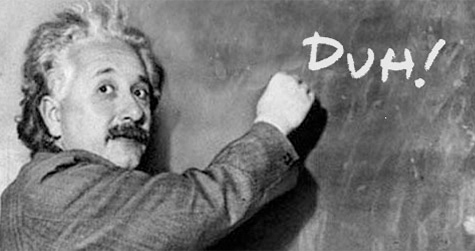 Click here to see the response from DSD to the question about the alledged accusations. Is the ONNP Ducking the issue? Only time will tell! And as we know that Darren Kirby the ONNP strategy manger visits this site on a regular basis we would like say to Darren we're looking forward to your reply and don't forget to send those other documents we requested! Cheers matey! We would like to say that no ducks were harmed in the commission of this protest and that a fully trained stunt duck was used! NOW OVER 5000 HITS & COUNTING - THANK YOU ALL FOR YOUR ONGOING SUPPORT! SDLP COUNCILLOR SEAN CARR CONFIRMS TO GALLIAGH RESIDENT DISPUTED PROJECT IS DERRY CITY COUNCILS! We would now ask that Sean informs not only the rest of his party colleagues but the rest of council including the officers who despite all the evidence to the contrary have also denied the project. Including the two senior council officers the city engineer & landscape architect who both signed the funding application to the DSD for £250,000 pounds. We just had the link to this sent to us. 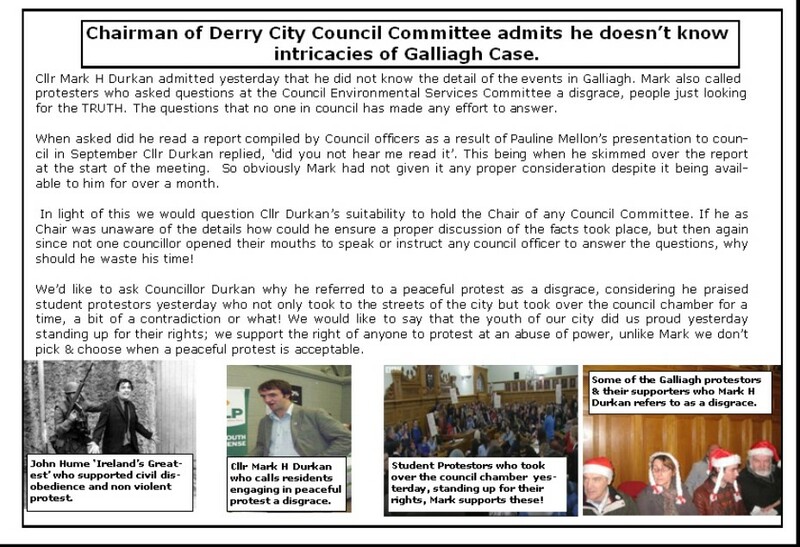 it seems that what Mark H Durkan thinks of Galliagh residents demanding answers from Derry City Council has spread, not to mention the glaring contradiction, thanks again to Mick for info & link! WILL THEY OR WON'T THEY? DERRY CITY COUNCIL YET TO CONFIRM RESIDENTS CAN ADDRESS MEETING! In the biggest will they or won't they since the Nescafe Gold Blend ads in the 1980's the question is will Derry City Council permit residents respond to the recent report compiled by council? Or is it the case that we are just being invited back so they can tell us what we are capable of reading ourselves? Or is it the case that they don't want to let us speak because we have a habit of asking questions that they really don't want to answer? Pauline Mellon of our group formally requested the right of address via the Environmental Services Chairman Cllr Mark H Durkan. Mark has not yet responded - we'll keep you updated. Thanks to our good friend Kevin for the scan! COLD WEATHER CONTINUES. LOOK OUT FOR YOUR NEIGHBOURS! 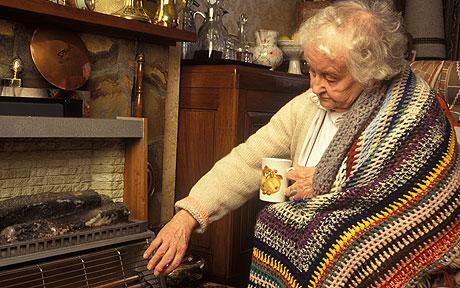 With the cold weather continuing unabated we would ask that everyone keep a special eye out on the elderly and vulnerable in our communities. The main roads in and around Galliagh and the surrounding areas are not too bad but the roads and pavements in the streets themselves are treacherous. If you are going to the shops do spare a thought for someone who may be unable to get out and about. There does seem to be a perception held by some that this website is steered by non residents. Despite popular belief people in Galliagh, do have jobs, can read, write and have opinions, some of us even drive cars- would you believe it! This is all our own work and unlike Derry City Council we acknowledge our work. 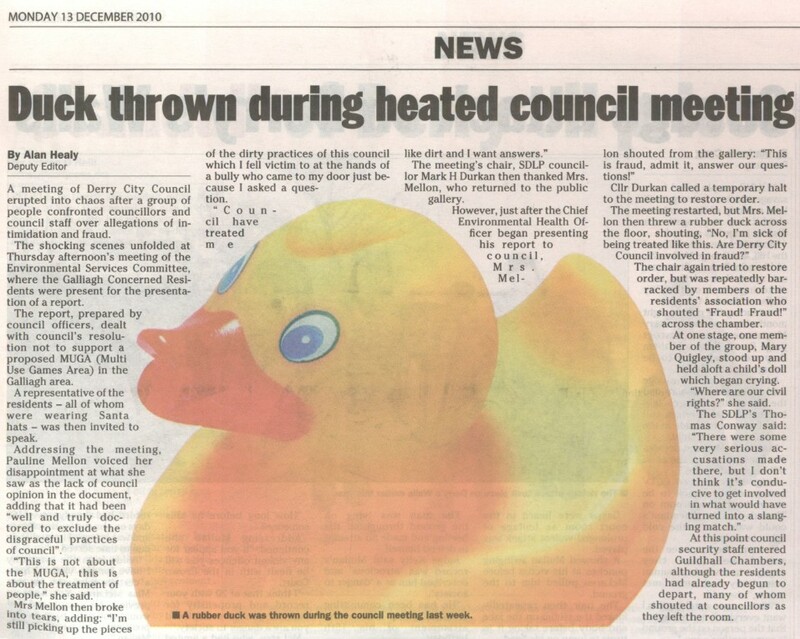 This is our duck just as the development in Galliagh is Council's duck. We were sent this link that a supporter found on youtube, and it's a belter. WILL RESIDENTS BE DENIED RIGHT TO SPEAK AT DERRY CITY COUNCIL ENVIRONMENTAL SERVICES COMMITTEE? It would seem that instead of being given the opportunity to respond to the hilarious report that Council prepared to 'answer' residents questions that the intention of council is to bring us back to tell us all about the report. Now this is interesting because we already have all the information contained in the report, including essential information that the report neglects such as the bit where a council officer the so called 'landscape architect' was to ensure a fully comprehensive consultation was carried out and report back to the council committee, needless to say that this employee didn't attend the consultations, didn't deliver a report and the council committee didn't even look for the report. we know this is true because when residents asked for a copy of this report the issue was fudged so we called in the information commissioner and council had to admit to them that NO SUCH REPORT EXISTED. So back to this upcoming meeting we are being brought back to have this report read to us and given no opportunity to address it is it because we are from Galliagh and are incapable of understanding it? YEAH RIGHT! Or is it because they know that the report is not worth the paper its printed on and it does not answer 1 single question raised by residents. So will Derry City Council ES committee deny residents the right to respond? Will Derry City Council indulge in censorship? WHY HAVE YOU DENIED THE MOST INTERESTED OF PARTIES A VOICE? WOULD YOU NOT AGREE THEY ARE ENTITLED TO ANSWERS? DO YOU FEEL IT'S RIGHT TO DISMISS YOUR OWN RESOLUTIONS AND PEOPLE WITH GENUINE CONCERNS? AND WOULD YOU AGREE THE RIGHTS OF PEOPLE SHOULD OUTWEIGH PROCESS, FUNDING DEADLINES AND AGENDAS? IF THE ANSWER TO EACH OR MOST OF THESE QUESTIONS IS YES, TO BE MILD THEN WE HAVE BEEN TREATED UNFAIRLY. Oh and on the subject of questions When Pauline Mellon & John Thompson of the CPI met Valerie Watts, John Meehan & John Kelpie she left a few similar questions with them, guess what they haven't responded! And at that meeting when Pauline asked John Kelpie the city engineer was it proper procedure for Derry City Council to apply for money on behalf of an unincorporated organisation Mr Kelpie refused to answer the question, considering his signature is on the application form as is that of the council landscape architect his sudden bought of shyness was intriguing. When Mr Kelpie was asked what the ONNP had done he refused to answer that one too. In a race between the ONNP & Derry City Council to not answer questions we reckon it would be hard to decide the winner. The legal position on bullying. Employers have a duty under the Health and Safety at Work Act 1974 to ensure the health, safety and welfare of their employees. If they do not do this they are breaching an individual’s contract of employment. It may also be a breach of sexual harassment and racial discrimination legislation as well as the Criminal Justice and Public Order Act 1994. 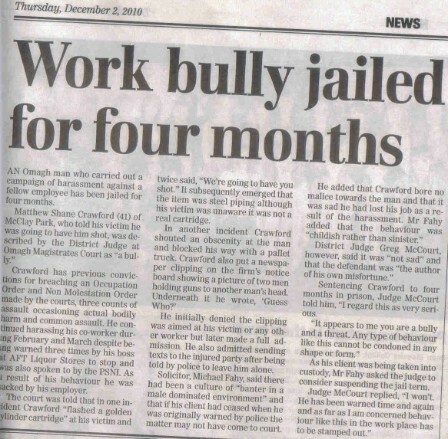 Employers and/or the bully may find themselves facing fines, compensation and possibly a jail sentence. We have had a lot of people ask about the situation involving a local SDLP Councillor and after giving due consideration and taking advice on the matter we are making the issue public. 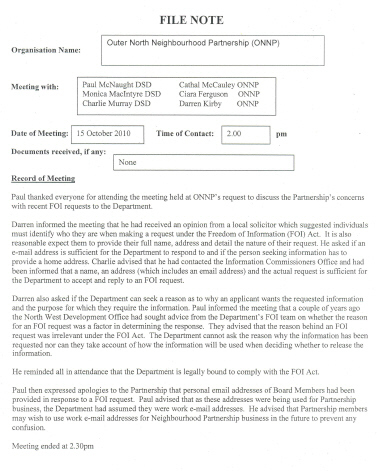 At the Derry City Council environmental services committee meeting on 9th September Cllr Shaun Gallagher of the SDLP stated that he 'was not a member of the Outer North Neighbourhood Partnership and knew nothing of their workings'. 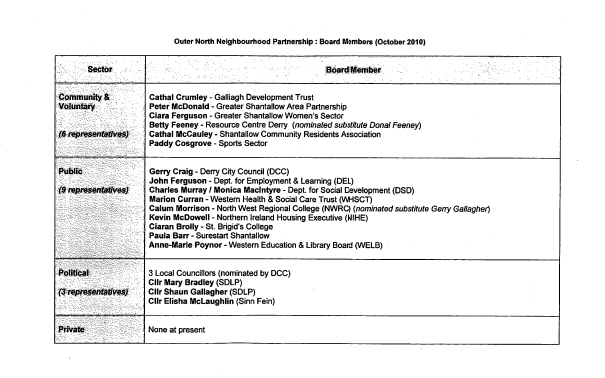 Residents were bemused by this as we were fully aware that Cllr Gallagher was listed as a member of the Outer North Neighbourhood Partnership. 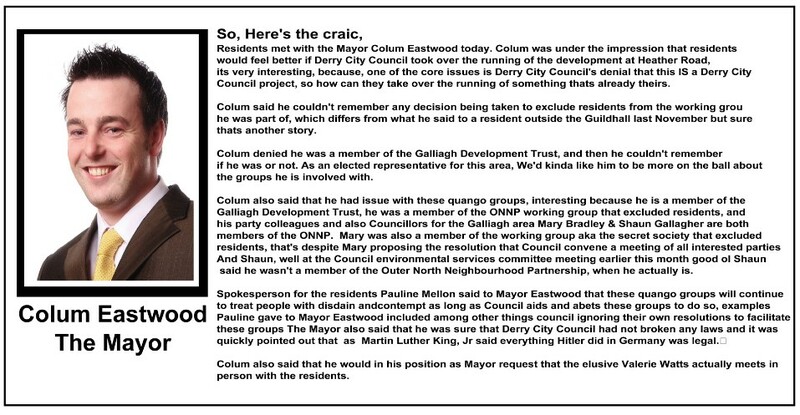 We decided that it would be a good idea to clarify Cllr Gallagher's comment and a letter was drafted and hand delivered to his home on 11th October 2010. At 10.30am the next day Cllr Gallagher arrived at the home of a member of our group. He told this person, (a young mother) that he had sought advice and demanded that she should withdraw the comment (this being a question). Cllr Gallagher also demanded to know if this young woman would be standing in the local government election. We would like to take this opportunity to inform Cllr Gallagher that anyone is entitled to execise their democratic right to stand for election if they so choose. Cllr Gallagher further berated this person and made a series of wild allegations before storming off. This intimidating behaviour left the young woman very shaken and she rang her husband who rushed home from work. The young woman rang the SDLP office on Bishop Street and spoke to them, gaining little reassurance. Her husband tried to make contact with Pat Ramsey, Pat was unavailable but Sean Carr took the call and gave some advice on the matter. 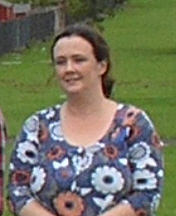 The young woman accompanied by her husband went to the Shantallow SDLP office and as no one was available to speak to them the young lady at the office kindly said she would fax a copy of the letter that was sent to Cllr Gallagher to MLA Mary Bradley at Stormont and that Mary would be in touch, over a month later Mary Bradley MLA has still to lift the phone to ask how this young woman is. The husband of the young woman 'visited' by Cllr Gallagher lodged a complaint with Mark Durkan's office, he also forwarded a complaint to SDLP party leader Margaret Ritchie. Mr Durkan acknowledged receipt of the letter, Margaret Ritchie did not. After numerous phone calls to Ms Ritchie's constituency office it was confirmed that the letter had been received and Ms Ritchie would be in touch. To date Margaret Ritchie has neither lifted the phone or put pen to paper to ask how this young woman was, or to give any indication of what the SDLP would do about this matter. Cllr Gallagher then sent a writtten reply to the original question posed to him. This reply not only gave more questions than answers but also confirmed everything that had been said in the letters to Mark Durkan & Margaret Ritchie. The GCRG wrote in response to this letter via Mark Durkan's office but as yet there has been no answers to the questions it contained. At present the SDLP Chief executive Michael Savage has been in touch and said they are dealing with this complaint. He will be meeting Cllr Gallagher on 2nd Dec to discuss the matter. The question is will the SDLP close ranks and try and brush this under the carpet, or will they give this serious matter the due consideration and deal with the disgraceful behavior displayed by Cllr Gallagher? We have uploaded the original letter to Councillor Gallagher, his written reply the letters to Mark Durkan and Margaret Ritchie and the letter from the GCRG responding to Cllr Gallagher. 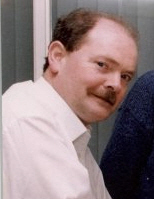 To read the letter to Cllr Shaun Gallagher 11th October Click here. To read the letter to Mark Durkan Click here. To read the letter to SDLP party leader Margaret Ritchie - Click Here. To read Shaun Gallagher's written reply to the original question Click Here. As you can see the documents speak for themselves. 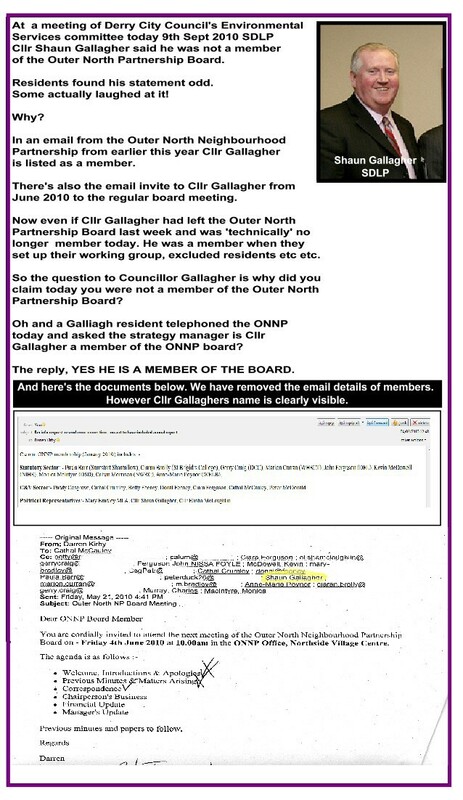 If Cllr Gallagher says he is not a member of the ONNP Board but they say he is are they a properly constituted group? In section 4.11 of the DSD memorandum of Understanding Document (the ONNP rules) it states 'The partnership must maintain an accurate record of all Partnership members.' So who is wrong here? So does this mean Cllr Gallagher's non attendance at meetings did not give any cause for concern to the ONNP, is this proper protcol and good practice? We hope to be able to provide the answers to you soon! 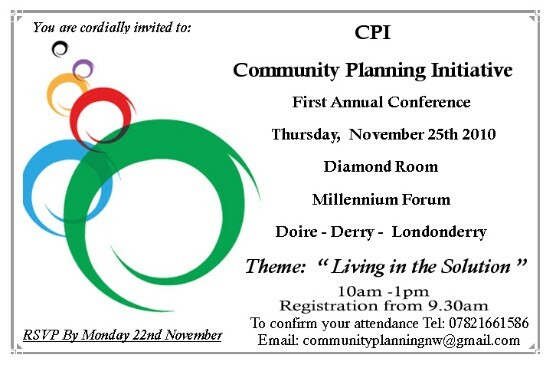 We'd like to take this opportunity to say how delighted we are to be invited to the First Annual Conference of the Community Planning Initiative. The CPI is an invaluable resource for any community facing difficulty stemmimg from proposed development. Speakers at the event include Dr Liam Byrne of Church Chambers Law (mediation specialists), Dr Helena Schlindwein Director of CHATS (Community Health & Training Services) and Galliagh Residents very own Pauline Mellon who will be relating how the CPI was beneficial to a community that was suffering bad practice at the hands of statutory bodies and self appointed groups. We'd also like to take this opportunity to express out thanks to Mr. John Thompson founder and Director of the CPI for all his support and advice and we look forward to reciprocating this with the CPI. THANK YOU JOHN - GOOD LUCK WITH THE CPI, YOU HAVE OUR FULL SUPPORT! At the Derry City Council Environmental Services Committee meeting on Sept 9th Councillor Shaun Gallagher claimed he was not a member of the Outer North Neighbourhood Partnership and knew nothing of their workings - residents have documents that dispute this and also confirmation from the strategy manager of the ONNP that Cllr Gallagher IS A MEMBER - We have today hand delivered a letter to Cllr Gallagher's home asking hime to clarify why he made these claims. We await his reply with baited breath. 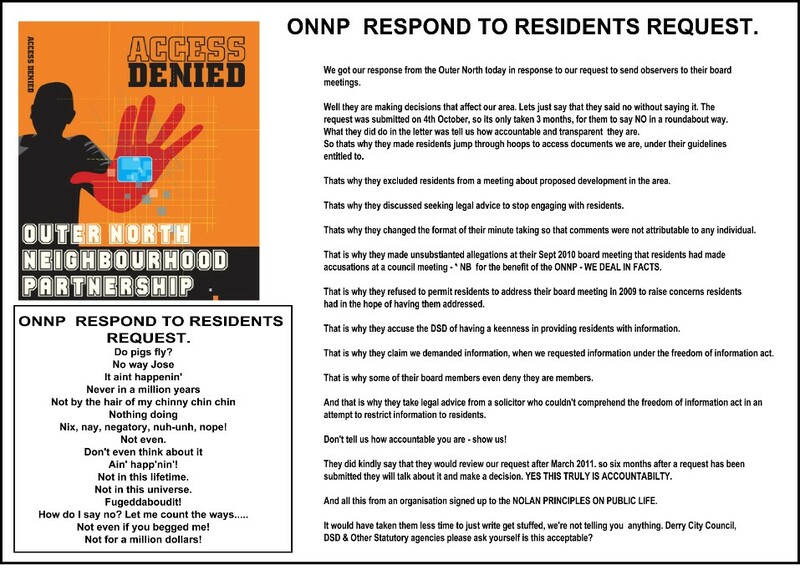 Residents wrote to the Outer North board earlier this week asking for a full list of dates, times and venues of ONNP board meetings so that we may send community observers to ensure transparency, openness and accountability. We have not received any acknowledgement of receipt of our letter to date. 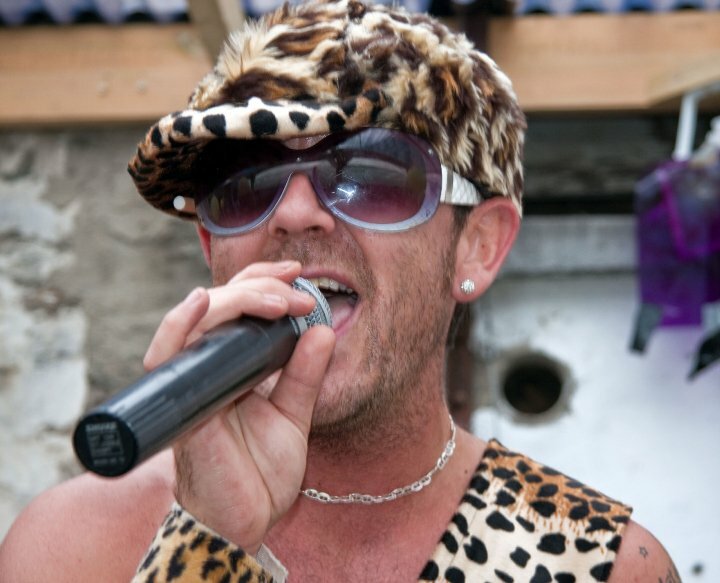 THE NEW HIGHLIGHT OF THE BANKS OF THE FOYLE HALLOWEEN CARNIVAL! PLEASE GIVE UP YOUR DAY JOBS! 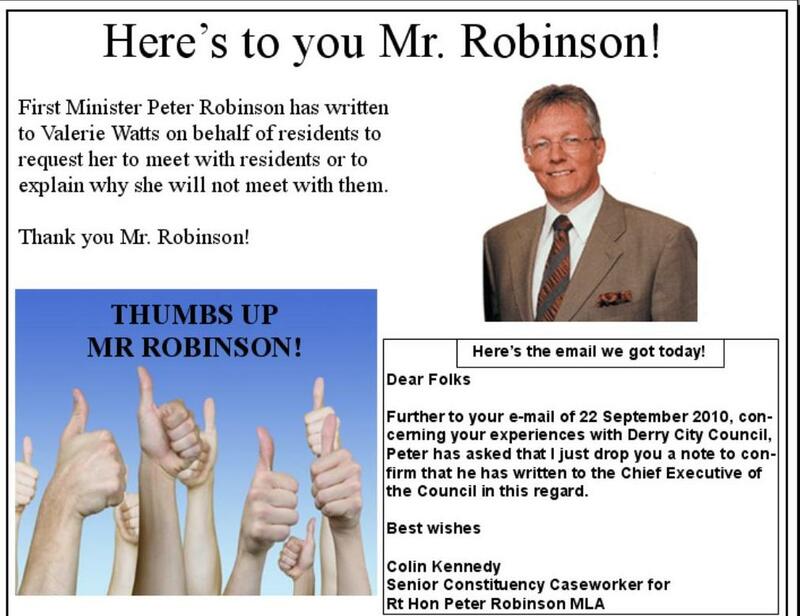 First Minister Peter Robinson MLA has written to Derry City Council Town Clerk & Chief Executive Valerie Watts to ask why she refuses to meet with residents. She has ignored residents calls for a meeting she has ignored Pat Ramsey MLA she has ignored Mark Durkan MP will she now ignore the First Minister? See below for details! First Minister Peter Robinson Has written to Derry City Council Town Clerk Valerie Watts to ask whey she will not meet with residents. INFORMATION COMMISSIONERS OFFICE FORCE COUNCIL TO ADMIT THEY DO NOT HAVE REPORT! 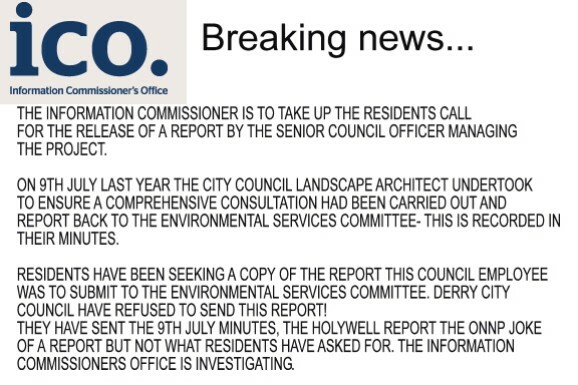 On the 9th July 2009 at a meeting of the Derry City Council environmental services committee a discussion took place around the developments in Galliagh, this was prior to the Holywell consultation. At this meeting it was resolved that a Council employee the ‘Landscape Architect’ was to ensure a comprehensive consultation was carried out and then he was to report back to the committee. Residents requested a copy of this report in March 2010, and had to call in the information commissioner because council wouldn’t produce a copy. 6 months on Council have been forced to admit they do not have this report. Now the truth of the matter is that this employee did not deliver any report to the Council Committee because he was not at any of the consultations. We got a letter from Deputy Town Clerk – John Meehan (right) today saying they couldn’t produce a document they did not have - This begs a very serious question how can an employee of Derry City Council not carry out a direct instruction from a Council committee? It must also be asked who is actually running Derry City Council? Why did the Environmental services committee not follow up on this report? Why are senior council officers allowing employees to do what they want? Has the city engineer asked his subordinate why he did not carry out a direct instruction? Does anyone in Council hold the penpushers to account? CLICK THE YOUTUBE LINK BELOW TO HEAR PAULINE MELLON ADDRESSING DERRY CITY COUNCIL - THEN READ THE COUNCIL MINUTES - DO THEY REFLECT WHAT PAULINE SPOKE OF IN HER PRESENTATION. RESIDENTS DONT THINK SO. DERRY CITY COUNCIL MINUTES NOTHING MORE THAN A JOKE! Residents today obtained a copy of the minutes from the Derry City Council environmental services committee that they addressed last month, to say that these minutes reflect the presentation delivered by Pauline Mellon of the Galliagh Residents is pathetic, and at best these minutes could only be described as grossly inaccurate but even that is a compliment. We are putting a transcript of Pauline's presentation and a copy of the council minutes online so everyone can compare both. We have also been told that a supporter of the residents in the public gallery recorded the entire meeting and we are hoping to have a full audio recording online tomorrow. Once again we have a fudge from Derry City Council, and if these minutes are anything to go by, the report that Council are preparing will be nothing more than a huge steaming pile of HORSESH1T. But it seems that the ordinary man in the street can expect nothing less from Derry City Council and the majority of Derry City Councillors. WHEN IN A HOLE PLEASE STOP DIGGING!!!!!! Here is the transcript of Pauline Mellon's presentation to Council. ONE YEAR ON AND WE ARE STILL IN LIMBO, WE HAVE BEEN IGNORED, DISMISSED, EXCLUDED, BRANDED A VOCAL MINORITY AND AN IMPEDIMENT TO DEVELOPMENT. WHEN I PRESENTED OUR CASE TO COUNCIL ON 1ST SEPTEMBER LAST YEAR. AT THAT STAGE WE HAD BEEN SUBJECTED TO LESS THAN ADEQUATE CONSULTATION, EMOTIONAL BLACKMAIL AND INTIMIDATION . NOT ONE COUNCILLOR OR COUNCIL OFFICER EVER DENIED THAT THIS WAS IN FACT A PROJECT OF DERRY CITY COUNCIL. AT THAT COUNCIL MEETING IT WAS RESOLVED THAT THERE WOULD BE A MEETING OF ALL INTERESTED PARTIES TO BE ARRANGED BY COUNCIL, THIS WAS TO ARRANGE A SUITABLE CONSULTATION AND TO DISCUSS CONCERNS. THIS MEETING OF ALL INTERESTED PARTIES NEVER TOOK PLACE. FOLLOWING THE SEPT 1ST RESOLUTION THE OUTER NORTH NEIGHBOUR HOOD PARTNERSHIP SET UP A WORKING GROUP AND ITS OWN CONSULTATION. THIS WORKING GROUP INCLUDED 3 COUNCILLORS WHO WERE PRESENT WHEN THE SEPTEMBER RESOLUTION WAS PASSED. THE COUNCILLOR WHO PROPOSED THE RESOLUTION BEING ONE OF THIS TRIO. WHEN RESIDENTS QUESTIONED WHY THE MEETING OF ALL INTERESTED PARTIES HADN'T TAKEN PLACE THEY WERE TOLD AT THAT STAGE 2 MEETINGS HAD ALREADY TRANSPIRED. IT MUST BE NOTED THAT THIS WORKING GROUP KEPT NO MINUTES OF THEIR DELIBERATIONS, OR ANY RECORD OF ATTENDANCE. SUMMONED TO A MEETING ON 27TH OCT BY THE OUTER NORTH, WE QUESTIONED WHY WE HAD BEEN EXCLUDED FROM THE PROCESS AND WERE TOLD, THERE WAS A UNANIMOUS DECISION TAKEN TO EXCLUDE US ON THE BASIS OF OUR STATED OPPOSITION TO THE PROPOSED ELEMENT OF THE DEVELOPMENT. IT WAS THEN SUGGESTED THAT IT WOULD HAVE BEEN NONSENSICAL TO INCLUDE THOSE WITH A DIFFERENT OPINION. WE HAVE CONSISTENTLY REFUSED TO ACCEPT THIS WORKING GROUP AS A SUBSTITUTE FOR THE MEETING OF ALL INTERESTED PARTIES THAT COUNCIL WAS TO ARRANGE. WHEN JOURNALIST EAMONN MCCANN QUESTIONED THE PROCESS A SPOKESPERSON FOR DERRY CITY COUNCIL EXPLAINED, THE PROPOSED DEVELOPMENT AT GALLIAGH IS BEING LED AND MANAGED BY THE ONNP AND THAT 'A CONSULTATION PROCESS HAS BEEN AGREED AND INITIATED BY A WORKING GROUP CONSISTING OF ONNP, COUNCIL REPRESENTATIVES, AND OTHERS. I MEAN SO MANY CONTRADICTIONS. WHEN WE RETURNED TO COUNCIL IN NOVEMBER WE THEN LEARNED FROM THE CITY SOLICITOR THAT THIS WASN'T A COUNCIL PROJECT THAT IT WAS A PROJECT OF THE OUTER NORTH NEIGHBOURHOOD PARTNERSHIP. THE OUTER NORTH HAVE STATED CLEARLY THAT THEY ARE MERELY SUPPORTIVE OF THE PROJECT AS HAVE THE GALLIAGH DEVELOPMENT TRUST. SO COUNCIL ACQUIRED THE LAND, DREW UP PLANS, APPLIED FOR PLANNING PERMISSION AND PAID FOR THE APPLICATION, APPLIED FOR FUNDING,UTILISED £85000 OF RATE PAYERS MONEY, PASSED THEIR PLANNING APPLICATION THROUGH THEIR COMMITTEE, COUNCIL WILL ALSO BE INSURING, MAINTAINING, AND CLEANSING THE PROJECT AND STILL DENIED THAT THIS WAS A COUNCIL PROJECT. WE HAVE OBTAINED COUNTLESS DOCUMENTS AND ARE NOW AWARE THAT THIS IS A PROJECT OF DERRY CITY COUNCIL. YOU ARE THE NAMED APPLICANT AND THE DSD BEING THE MAJORITY FUNDER HAVE STATED THAT DERRY CITY COUNCIL ARE THE PROJECT PROMOTERS. I WOULD IMAGINE ANY BODY ALLOCATING FUNDING TO THE TUNE OF £250000 WOULD BE AWARE OF FACTS. WE HAVE ALWAYS BEEN SUPPORTIVE OF THE PLAY PARK BUT FELT THE MUGA ELEMENT WOULD BE BEST PLACED IN ANOTHER PART OF THE ESTATE, ALLOWING THE CHILDREN THERE SAFE ACCESS TO A FACILITY. I RAISED THIS POINT CONSTANTLY DURING THE PUBLIC CONSULTATION LAST YEAR BUT LIKE MANY OTHER VOICES IT REMAINED UNHEARD. ONE RESIDENT BELIEVES WE WERE NEVER GIVEN CONSULTATION JUST NOTIFICATION. WHEN THE HOLYWELL PUBLIC CONSULTATION TOOK PLACE LAST YEAR, NOT ONE COUNCILLOR OR COUNCIL OFFICER WAS IN ATTENDANCE TO EXPLAIN COUNCILS ROLE. IN FACT AT A MEETING OF THIS VERY COMMITTEE ON THE 9TH OF JULY LAST YEAR THE LANDSCAPE ARCHITECT UNDERTOOK TO ENSURE A FULLY COMPREHENSIVE CONSULTATION WAS CARRIED OUT. HE WAS THEN TO SUBMIT A COPY OF HIS REPORT TO THIS COMMITTEE, DID ANYONE FOLLOW UP ON THIS REPORT? OR WAS THIS POINTLESS GIVEN THE OFFICER TASKED WITH THIS DUTY WAS IN FACT ABSENT FROM ALL THREE CONSULTATIONS. UNLIKE THIS OFFICER I WAS PRESENT AT ALL THREE SO I'LL GIVE YOU A BRIEF REPORT FROM MEMORY. THE 1ST CONSULTATION SAW A DISGRUNTLED RESIDENT STORM OUT AS HE WAS DISGUSTED AT THE PROCESS. AT THE 2ND CONSULTATION, WE WERE THREATENED AND THE 3RD CONSULTATION SAW 100 RESIDENTS WALK OUT IN DISGUST. I THINK IT'S FAIR TO SAY THE MEETINGS LACKED THE POSITIVE NOTE. IT HAS TO BE SAID THE GALLIAGH DEVELOPMENT TRUST QUOTE FREQUENTLY FROM THE QUINN REPORT, IN THEIR FUNDING APPLICATIONS AND MONITORING RETURNS. THIS REPORT IN A WORD IS FICTIONAL. IT STATES THERE IS ONE SHOP IN GALLIAGH AND WE ARE BASICALLY A BUNCH OF REPROBATES. THIS REPORT IS SO FLAWED THE DSD WHO PAID FOR THIS WORK OF ART REFUSED TO SIGN OF ON IT. WE HAVE RECENTLY QUESTIONED THE DSD REGARDING HOW AND WHY THEY FUND GROUPS WHO QUOTE FROM A DOCUMENT THAT THEY THEMSELVES WOULD NOT SIGN OFF ON. WE HAVE RECEIVED A FUDGE OF AN ANSWER BUT INTEND TO KEEP QUESTIONING. AFTER READING THE ONNP MINUTES FROM 12TH FEB THIS YEAR WE HAVE LEARNED THAT WE ARE SOMEWHAT OF A NUISANCE TO PROCESS, AND TO QUOTE A COUNCILLOR THIS GROUP HAS DWINDLED DOWN TO JUST A FEW RESIDENTS. IF THE GROUP HAD OF DWINDLED DOWN TO ONE, SURELY THESE CONCERNS STILL NEEDED TO BE ADDRESSED. ANOTHER QUOTE FROM THE MINUTES/ IT WOULD DO NO HARM TO CREATE A LEGAL FRAMEWORK TO END ALL CORRESPONDENCE. 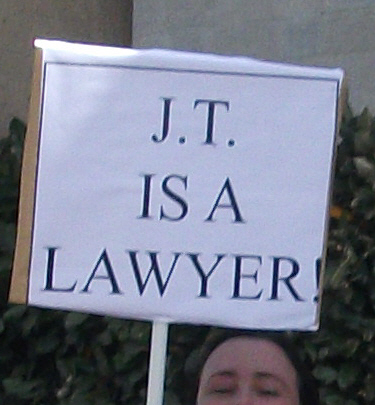 AS THIS PERSON WAS SURE A LOCAL BARRISTER WAS ADVISING RESIDENTS TO CREATE A PAPER TRAIL. BOTH QUOTES ARE FROM BOARD MEMBERS OF THE ONNP, THESE PEOPLE ARE ALSO PAID EMPLOYEES OF THE GALLIAGH DEVELOPMENT TRUST THE GROUP THAT SUPPOSEDLY WORK FOR THE GREAT AND GOOD OF PEOPLE IN OUR AREA. FOR GROUPS SIGNED UP TO THE NOLAN PRINCIPALS IT IS QUITE OBVIOUS THESE GROUP WOULDN'T KNOW THE NOLAN PRINCIPALS FROM THE NOLAN SISTERS. I RESENT THAT OUR LEGAL AGENT HAS BEEN GIVEN THE CREDIT FOR OUR RESEARCH, IMAGINE PEOPLE FROM GALLIAGH CAPABLE OF READING WRITING AND USING THEIR INITIATIVE. HOW WOULD THAT LOOK ON A FUNDING APPLICATIONS FOR THOSE WHO DO LITTLE MORE THAN JUSTIFY THEIR OWN EXISTENCE? IT'S PITIFUL WHEN RESIDENTS FROM WHAT IS CLASSED AS A DEPRIVED AREA ARE FORCED TO EMPLOY THE SERVICES OF SOMEONE LIKE MR THOMPSON TO CLARIFY MATTERS THAT COUNCIL AS APPLICANT AND PROMOTER OF THIS PROJECT HAVE REFUSED TO DO. THIS HAS BECOME A LOT MORE THAN A MUGA IN GALLIAGH, THERE ARE ISSUES OF ACCOUNTABILITY, TRANSPARENCY, DEMOCRACY, CONSULTATION AND RESPECT. WE HAVE CONTACTED COUNCIL TWICE IN AN ATTEMPT TO HAVE OUR CONCERNS ADDRESSED AND HAD BEEN IGNORED UP UNTIL RECENTLY WERE WE RECEIVED AN ACKNOWLEDGEMENT. THE RESIDENTS OF BALLYNAGARD IN CULMORE ARE ASTONISHED THAT WE HAVE NEVER HAD THE COURTESY OF A MEETING, GIVEN THEY HAVE HAD THE PRIVILEGE OF A FEW. WE RECENTLY CONTACTED OUR MAYOR WHO TO DATE HAS ONLY REPLIED THROUGH FACEBOOK. NOW IF YOU DON'T MIND I HAVE A FEW QUESTIONS. THE PEOPLE OF THE HEATHER ROAD ARE NOT A VOCAL MINORITY, THESE PEOPLE MAKE UP THE MAJORITY OF THOSE DIRECTLY AFFECTED, PEOPLE WHO WILL HAVE THESE FACILITIES ON THEIR DOORSTEP FOR YEARS TO COME. THEY ARE UPSTANDING AND OUTSTANDING MEMBERS OF MY COMMUNITY MANY OF WHO WERE ACTIVE WITHIN THE COMMUNITY BEFORE FUNDING AND WAGES BECAME THE NORM. THEY ARE ENTITLED TO ANSWERS, A VOICE AND MOST IMPORTANTLY RESPECT. I WOULD LIKE TO RECOMMEND THAT COUNCIL MEET WITH RESIDENTS ASAP AND THEN MEET WITH NEIGHBOURHOOD PARTNERSHIP GROUPS AND EXPLAIN, WHEN THEIR ACTIONS ARE INAPPROPRIATE THAT THIS REFLECTS BADLY ON COUNCIL AS A STATUTORY BODY, BECAUSE UNLIKE THEMSELVES AND HERES FOOD FOR THOUGHT, YOU ARE IN FACT ACCOUNTABLE TO THE COMMUNITY. Present:- Councillor Durkan (in the Chair), Aldermen Hamilton and Thompson, Councillors Carr, Clifford, Conway, Gallagher and Hassan. In Attendance:- City Engineer (Mr. J. Kelpie), Chief Environmental Health Officer (Mr. P. O’Doherty), Chief Building Control Officer (Mr. A. Tohill), Landscape Architect (Mr. C. Kennedy), Access Officer (Dr. W. Burke), Grounds Maintenance Technical Officer (Mr. J. Flood), Biodiversity Officer (Ms. C. Doherty) Wildlife Education Officer (Ms. A. Mullan) and Committee Clerk (Ms. N. Meehan). ES217/10 Notice and Summons for Meeting. The City Engineer read the Notice and Summons for Meeting. Apologies for absence were received from Alderman Miller, Councillors Eastwood, MacLochlainn and Page. Minutes of Monthly Environmental Services Committee held on 8th July, 2010 and Monthly Environmental Services (Licensing) Committee held on 8th July, 2010 were confirmed and signed by the Chairperson as correct. ES220/10 Deputation – Development at Galliagh. Members were advised that a request had been received from Ms. P. Mellon, to be received as a deputation by the Committee in relation to Council’s role with regard to developments at Galliagh, particularly the MUGA, and concerns in respect of the Neighbourhood Renewal process. The Committee agreed to receive the deputation. Ms. Mellon thanked Members for granting her the opportunity to address the Committee. She expressed serious concerns at the lack of meaningful consultation and the exclusion of Galliagh Concerned Residents’ Group from the consultation process in respect of the development at Galliagh. She referred to inaccurate suggestions throughout the process that those residents who had expressed concern at the proposals for the scheme were opposed to any development in the area. Residents were never against development, and would welcome facilities for the community. However, it was felt the type and location of facilities should only be agreed following consultation and agreement with the entire community. She also expressed concern at the arrogance displayed by the Galliagh Development Trust towards residents throughout the consultation process. Ms. Mellon pointed out that following the group’s attendance at a Meeting of Council’s Planning Committee held on 1st September 2009 regarding the consultation process many residents had been subjected to emotional blackmail and intimidation. Following that Meeting it had been agreed that Council arrange a meeting of all interested parties to discuss the proposals and to afford residents an opportunity to voice their concerns. However, such a meeting never took place. Ms. Mellon referred to the Working Group established by the Outer North Neighbourhood Partnership to carry out its own consultation and whose membership included three elected representatives. The Working Group, despite the sensitivities surrounding the proposals kept no minutes or official record of their deliberations including attendance records. The Group met on three occasions but concerned residents were not invited to attend these meetings. Residents were however, summoned to attend a subsequent meeting held on 27th October, 2009 when they were advised that they had been purposefully excluded from participating in the Working Group on the basis of their objection to elements of the development and this had been a unanimous decision by all Members of the group – a group which included Councillors and one senior Council Officer. She acknowledged however, that Council had not been responsible for the establishment of the Working Group or for issuing invitations to attend meetings. She concluded that the consultation process had been seriously flawed from the outset. Ms. Mellon acknowledged the need for suitable play facilities in Galliagh but stressed that any such facilities must be complimentary to the surrounding area. Residents’ concerns regarding the proposals were in relation to their potential for creating anti-social behavior. Ms. Mellon referred to the opinion expressed by the City Secretary and Solicitor at the November 2009 Meeting of the Environmental Services Committee “that this was not a project of Derry City Council, it was, instead, an Outer North Neighbourhood Partnership project. He stated that since the essential elements of the project – a play park and a MUGA were facilities which fell within the district Council functions, the City Council was asked to provide technical assistance, part of which was the Council undertaking to submit the planning application”. Ms. Mellon confirmed that DSD had also indicated that Council was the promoter of the project having stated in previous correspondence that “Derry City Council is the project promoter and ultimately any decision to proceed with this project will rest with them”. She expressed concern that Council had not become involved in the consultation process to explain its role or remit in relation to the project. Ms. Mellon requested that Council meet with residents to address their concerns in relation to the consultation process. She further requested that the Outer North Neighbourhood Partnership be advised that any inappropriate action in relation to the process reflected poorly on Council as the promoter of the project. Members commended Ms. Mellon on her presentation. A member of the SDLP grouping expressed concern that the consultation process had not gone as anticipated following the residents’ previous submissions to Council. He referred to an earlier decision that residents would have access to the consultation process, which given the content of the deputation clearly did not take place. He referred to the decision taken at the Meeting of the Planning Committee held on 1st September, 2009 that Council arrange a meeting of all interested parties to discuss the proposal and queried why this had not been arranged a matter which required urgent ratification. He empathized with residents’ frustration at their exclusion from the process. The said member recalled that during the initial consultation process those involved in carrying out door to door consultations had proclaimed to represent Derry City Council. He referred to the need for the situation to be clarified as a matter of urgency and the current position determined in relation to the development. He acknowledged that Council had agreed to the development of a children’s play area at Heather Road. He then requested that Officers prepare a detailed report on this matter for submission to the next Meeting of the Committee. Various Members echoed their support for the above comments. A member of the Sinn Fein grouping pointed out that Galliagh Concerned Residents were made clearly aware that the MUGA development at Heather Road would not proceed now or in the future. He also expressed concern at the consultation process which was carried out, which he agreed was somewhat flawed. He agreed that an in-depth report on the matter be submitted to the next Meeting of the Committee. A member of the SDLP grouping referred to the importance of how Council proceeds in relation to this issue. He disagreed with the City Secretary and Solicitor’s earlier comments that this project was not the responsibility of Council. If Council submitted a planning application in respect of the proposed works and allocated funding it was the responsibility of Council to guarantee a full, open and transparent consultation process. He referred to the need for a follow-up on the consultation process which had been carried out which in this instance he did not feel the residents had been granted and which reflected poorly on Council. Another member of the SDLP grouping requested that an investigation be carried out into the process in respect of this development from the outset. He acknowledged that there were many areas of concern in relation to the consultation process and agreed that a number of questions remained unanswered in relation to Council’s position in this regard. He supported for the submission of an in-depth report on the matter to the next Meeting of the Committee. The Chairperson said he understood following the residents’ last attendance at a Council Meeting that a full, open and transparent consultation would take place. However, obviously this had not happened to the satisfaction of the concerned residents which did little for the reputation of Council. He undertook to have the matter addressed. The City Engineer indicated that he did not wish to comment at this stage. The deputation was thanked for their attendance and they withdrew from the Meeting. One of the questions people have been asking us is WHY Valerie Watts REFUSES to meet with residents, they have asked us have we requested to meet Ms Watts and the answer is YES, we have written to Valerie Watts and invited her to meet with us on multiple occassions. So we thought, if Valerie feels it's ok for her to ignore residents, ignore requests from Mark Durkan MP then we would ask all the MLA's and MP's to write to Valerie and request that she meet with residents. And if she refuses to meet with residents to explain why to them. In an era of openness and transparency in government surely it stands to reason that a request from residents to address issues not only about council, but to address matters raised in letters from Ms Watts is not an outlandish request. I apologise for contacting you out of the blue, and appreciate how busy you must be, but if you would be able to spare a few minutes our community would be very grateful. information, this has given residents serious cause for concern and needs to be addressed with the utmost urgency. in writing and we believe a face to face meeting would be a positive step forward in resolving this matter. with Ms Watts would be central to helping resolve some of these, and other issues. meet with residents as soon as possible, or to explain to you why she has declined invitations to meet with residents. group of concerned residents to request a meeting with their Town Clerk is not an outlandish request. I have taken the liberty of including Ms.Watts contact details below in the hope that you would make contact on our behalf. 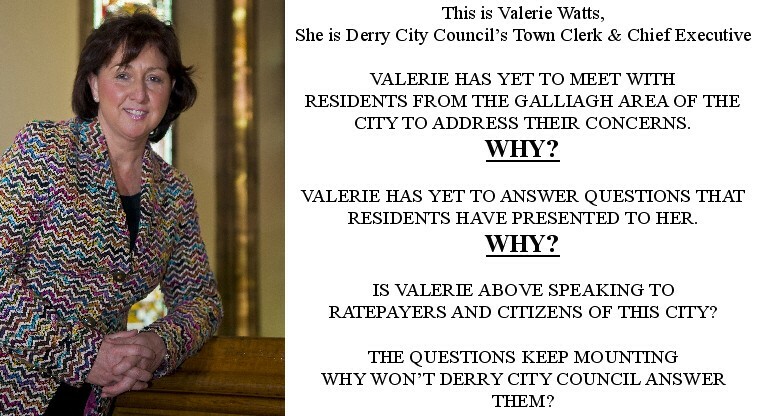 As you may be aware residents have submitted letters to Valerie Watts Derry City Council Town Clerk & Chief Executive - you can read the main one sent to Ms Watts on 19th July on this website. 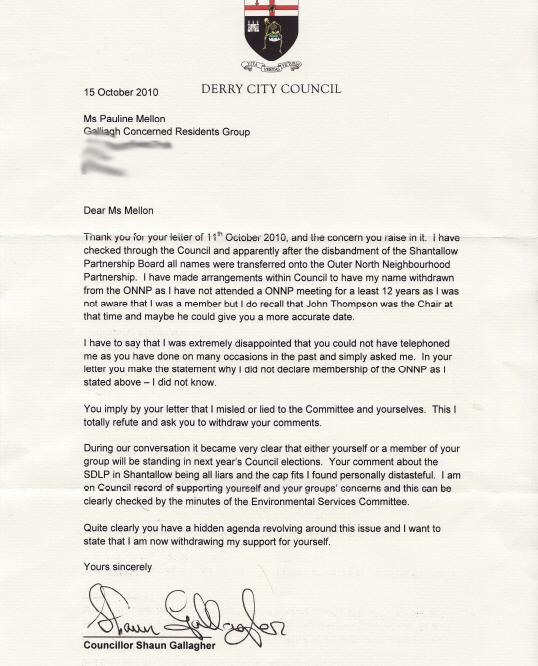 This letter raises serious concerns about how Derry City Council conducts its business. We received a response today from Ms. Watts and if ever there was evidence to support what people feel about Derry City Council, this is it. Not one question has been answered, or one concern addressed. This is despite Mark Durkan the Minister of Parliamentfor this area writing to Ms. Watts on this matter. We've taken the liberty of putting a copy of Minister Durkan's letter below the response from Ms Watts. It must also be noted that at the meeting held with Deputy Town Clerk & Chief Executive Mr John Meehan referred to by Ms Watts in her letter that Mr Meehan stated that it was his view that this was indeed a Derry City Council project. This has been the only meeting residents have been afforded to date. other hand is doing? Is it also the case that not only does Derry City Council feel it can dismiss residents, but also requests from the Minister of Parliament for the city. I refer to your letter of 19th July 2010 requesting a meeting with me. However, you have already met with the Deputy Town Clerk and Chief Executive, as a result of which, Ms P Mellon of your group requested and was granted facilities to come on deputation to address the September Meeting of the Environmental Services Committee which was held on Thursday, 9th September. I also note that you were afforded deputation facilities on a previous occasion to address the Council’s Planning Committee and that you were also present at a subsequent meeting of the Council’s Environmental Services Committee, in addition to the recent meeting you had with the Deputy Town Clerk and Chief Executive. Further, I note that you have received full replies to a considerable number of Freedom of Information Act requests and that a further request is currently being processed. These responses, I respectfully suggest, address the matters you raise in your e-mail to me to all intents and purposes. I would also suggest that many of the matters you raise have now been addressed through your attendance at last week’s meeting of the Environmental Services Committee. I confirm again, as you know, that the promoter of this project is the Outer North Neighbourhood Partnership in which the Council is one of a number of partners. It occurs that your concerns may relate, at least in part, to the neighbourhood renewal process. If so, you may wish to raise this with the Department for Social Development. Residents today received a copy of the DSD Watters report, an economic appraisal into the need for a neighbourhood centre in Galliagh. The report confirms what we have claimed all along that there are sufficient facilities in the Galliagh area and that these should be regenerated negating the need to destroy greens at Bloomfield. When contacted by Mark Watters of FGS MCClure Watters the consultants behind the document we stated 'We strongly believe that existing services and facilities in our community need to be safeguarded and supported, we feel that regeneration should mean regeneration. There is a fear that the 'neighbourhood centre' if it proceeds in line with current GDT/ONNP plans will be used to house pet projects to the detriment of groups that do not want to come under the banner of this centre and affiliated organisations, this would include groups such as ours who are residents and not affiliated with ‘clique’ groups. This report vindicates the position residents have held and promoted since the beginning of this process and supports our stance that who better to decide what is needed in our community than the people who live here, not the unelected quangos such as the Galliagh Development Trust and the Outer North Neighbourhood Partnership. Below is a copy of the conclusion of the report. It must be noted that the Galliagh Development Trust had based their plans for this centre on the findings of the Quinn report which you can see sections of on this website, the Quinn report was so flawed the DSD who paid for it refused to sign off on it, and as you can see further below is the Galliagh Development Trust position from last August as published in the Derry Journal. Residents addressed Derry City Council's Environmental Services Committee today to present issues surrounding how Derry City Council deals with so called neighbourhood renewal groups and unelected quangos. The presentation went well. Cllr Shaun Gallagher proposed that council provide a full written report covering the entire process to date. We await this with baited breath. For some interesting details that emerged during the meeting read on below. We would like to take the opportunity to thank everyone who showed up, indeed so many showed up that the Council had to add more chairs to the public gallery! We were delighted to meet up with residents from Ballynagard, West end park and residents from Pennyburn who face similar issues. We welcome your support and appreciate you taking the time. A member of the Galliagh Concerned Residents Group contacted Council today on behalf of residents who had their bins destroyed last night. Council were at first insistent that these residents, including pensioners would have to purchase their own bins. Council have a statutory duty to collect rubbish and when asked if they would collect rubbish if in black bags they said no. When it was pointed out that these people do not have bins because of the anti social behaviour at this new council facility, they were still adamant people would have to buy their own bins. So lets just say after some gentle persuasion from residents the City Council relented. A victory for common sense! The increased anti social behaviour continues on the Heather Road. At least 8 residents including pensioners who live adjacent to the new park had their wheelie bins torched last night. When residents were first told of the plans they were not only told to expect increased anti social behaviour, but that they would have to police it themselves. When residents raised their concerns with Council last year and higlighted the fears the held over anti social behaviour, Council ignored them, The logo on the side of the Derry City Vehicles states Derry City Council 'Working for You'. There's just something hollow about that! Residents are also still awaiting a response from Valerie Watts to the letter sent to her on the 19th July 2010. The only response we have received from the City Mayor Colum Eastwood to the letter we sent to him was through his facebook page! A SENIOR COUNCIL OFFICER HAS CONFIRMED TO RESIDENTS THAT THE DEVELOPMENTS IN GALLIAGH ARE INDEED A DERRY CITY COUNCIL PROJECT. DESPITE DENIALS FROM THE TOWN CLERK AND THE CITY SOLICITOR THAT IT WASN'T. THIS INDIVIDUAL CANNOT UNDERSTAND WHY THE COUNCIL HAVE DENIED THEIR ROLE IN THE PROJECT. THIS WAS SAID IN THE PRESENCE OF INDEPENDENT WITNESSES. The attack on Michael after the pride parade in Derry on Saturday was an attack on the entire Galliagh community. Mickey speaking today on the Mark Patterson show on BBC Radio Foyle showed more decency and humanity than the neanderthal thugs who attacked him. One of our group who was volunteering as a steward on the parade said that Mickey's & his troupes performance was a highlight of the day. Keep smiling Mickey, these balloons aren't fit to lace your shoes. Interesting article in todays Derry news about the developments proposed for the Culmore area. The article quotes our City Mayor Cllr Colum Eastwood, Colum raises two issues flooding and anti social behaviour. Oddly enough those were two of the issues raised by residents in Galliagh. Residents who at present are bearing the brunt of increased anti- social behaviour. Now here's the thing will Colum take part in secret meetings that exclude residents from the Clumlore area? 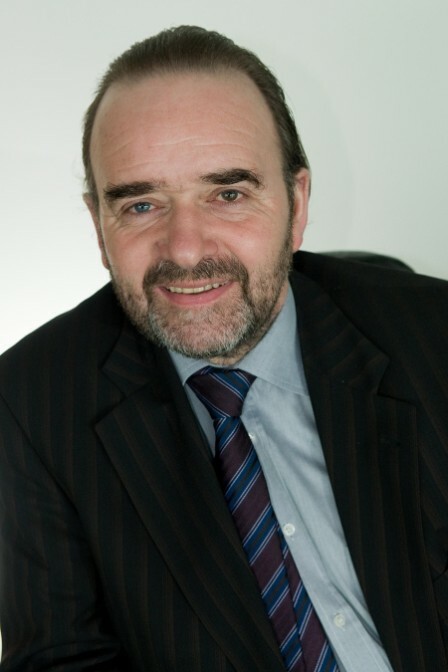 Will Colum and the other city councillors ignore council resolutions? They did when it came to Galliagh! Residents still awaiting the confirmation of a meeting with Derry City Council Town Clerk & Chief Executive, Valerie Watts. The meeting with the Ombudsmans staff was very positive and gave residents insight into further areas that we can explore. The new documentation residents have obtained, although not part of the initial complaints did raise some eyebrows. Residents have obtained some startling new documents. Residents in conjunction with advisors are currently evaluating the content of these documents and will also be presenting these documents at the meeting tomorrow with the Ombudsmans Office representatives to garner their opinion. 22nd August 2600 hits thank you to everyone for their support! Messages on the contact us section now updated. Residents met with the deputy town clerk Mr John Meehan, last week as a precursor to meeting town clerk Valerie Watts. Mr Meehan was astounded at what was actually going on. This is a positive move and very welcome. Again, thanks to Pat Ramsey! Also Residents will be meeting the NI Ombudsman director of investigations and their chief investigator this Tuesday. 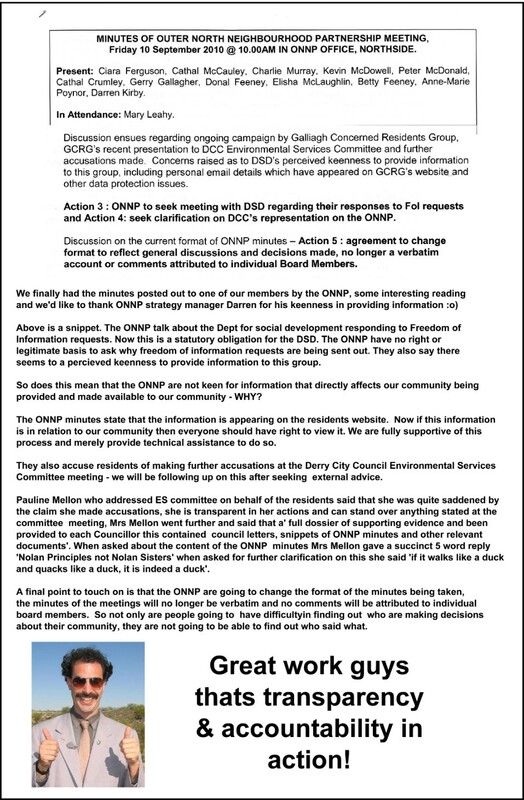 THE DERRY JOURNAL DID NOT PUBLISH A RESIDENTS RESPONSE TO TONY HASSAN'S LETTER PUBLISHED LAST WEEK, THEY ALSO DID NOT COVER THE RECENT COMPLAINT TO THE OMBUDSMAN AGAINST DERRY CITY COUNCIL. YOU CAN READ THE RESIDENTS RESPONSE TO TONY HASSAN'S LETTER FURTHER DOWN THIS PAGE. 18th August 2010 Things are happening... Watch this space! Further to our conversation on Wednesday 11 August I have discussed your case with the Institute Director, Rhion Jones, and we have decided to write to Derry City Council to raise certain questions about their consultation processes and practice. Due to the fact that Derry City Council is not a member of the Institute, nor have they attended any of our training courses, we may be able to offer them some assistance in developing their public engagement skills. We await their response and will get back to you in due course. In the meantime, if you have any further concerns please do not hesitate to get in contact with me. Fair Play to Mark Durkan & Pat Ramsey - The rest of the SDLP in Derry please take note! Response to the letter in Derry Journal from Derry Cllr Tony Hassan. In response to Councillor Tony Hassans assertions in his letter printed in the Derry Journal on Friday 13th August, I would like to request a right to reply to rectify some inaccurracies. Firstly regarding the MUGA not proceeding until major consultation takes place, residents experience of consultation to date, has in a word been sour. Past consultations have been missing the word meaningful. 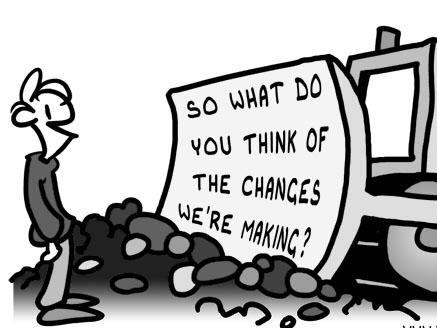 The initial Holywell consultation has been acknowledged by Council as lacking substance, consultations that neither you, or any other council representative elected or otherwise attended despite it being a Derry City Council project. Given that the council resolution of September 1st was ignored 'that planning application no. A/2009/0405/F be deferred and in the meantime a meeting be arranged by Council of all the interested parties to discuss the proposals.' residents have no faith in the word of Derry City Council. We would apply the same to the elected representatives who sat at meetings fully aware residents were excluded from these meetings. Cllr Hassan was an attendee at the council meeting when the resolution was passed and also a member of the working group that ignored the Council resolution and excluded residents. Residents actually only became aware of these meetings taking place after we rang Cllr Hassan to ask when the meeting of interested parties would take place to find that two meetings of the secret society had already transpired. Residents have refused to accept this working group as a substitute for the meeting of all interested parties that council promised. At the september 1st meeting you Cllr Hassan heard of how residents had been demonised, threatened and subject to emotional blackmail over money that had been already applied for to proceed with the project. So I think it's fair to say the second consultation was little more than a pacifying tactic. This project consists of two elements 1. The play park 2. The muga. So when Eamonn referred to the project that is what he meant. This is also clarified in the newly released Derry City Council play strategy document and of course in the original council planning application. I have scanned through Eamonn McCanns article and he didn't say that residents have had difficulty in meeting with councillors, he stated we have been denied a written response to letters sent to the council chief executive and councillors. To clarify another point, Raymond McCartney and yourself did take the time to meet with us, and as we said then it was much appreciated, even though it was somewhat after the fact. You did try to encourage us to become involved in the neighbourhood partnership, but to be blunt when residents requested to meet with the neighbourhood partnership they refused to meet us. This is evidenced in their minutes from Sept 2009, so why would we be part of an group that refused to meet residents. This is the same neighbourhood partnership who invited Cllr Hassan onto their working group but state that 'the working group was facilitated by ONNP but neither accountable to, or responsible to the ONNP.' Maybe Cllr Hassan could clarify just who this working group he was part of was accountable to? 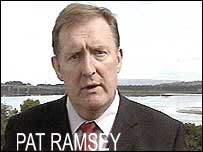 TRUE TO HIS WORD PAT RAMSEY HAS BEEN IN TOUCH WITH RESIDENTS AND TOLD THEM AFTER NOT HEARING BACK FROM DCC BY PHONE HE EMAILED VALERIE WATTS. FAIR PLAY TO YOU PAT! VALERIE WATTS HAS ACKNOWLEDGED OUR LETTER OF 19TH JULY AND THE LETTER HAND DELIVERED ON 27TH JULY TO MARK ONE YEAR ON FROM HOLYWELL. CITY MAYOR COLUM EASTWOOD WHO REPLIED TO THE RESIDENTS LETTER SENT TO HIM IN A CURT FACE BOOK POSTING HAS STILL NOT OFFICIALLY ACKNOWLEDGED THE LETTER. RESIDENTS HAVE BEEN IN TOUCH WITH REPRESENTATIVES FROM THE CONSULTATION INSTITUTE AND THEY COULD NOT BELIEVE THIS ENTIRE SCENARIO, MORE DETAILS TO FOLLOW. Journalist & Civil Rights campaigner Eamonn McCann wrote a fantastic article on the ongoing situation in Galliagh in the Derry Journal (10th August 2010) Click the link below to read the article. 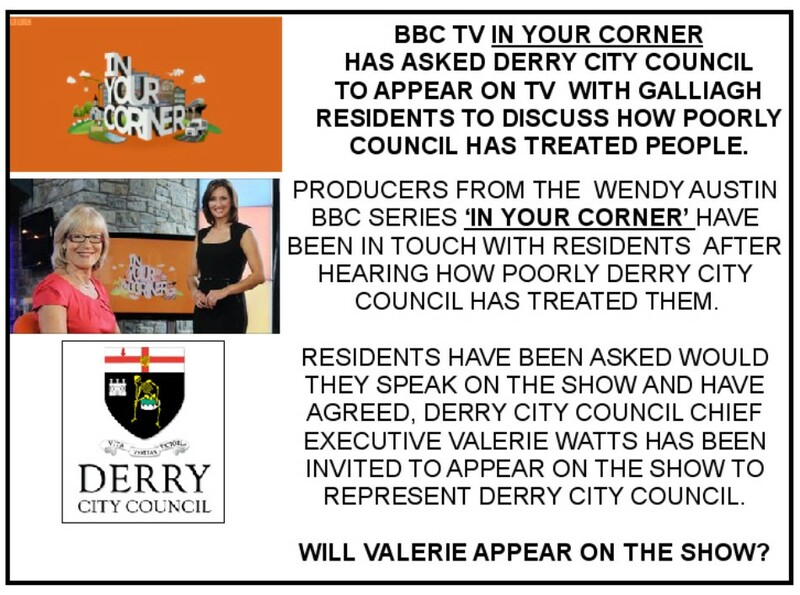 BREAKING NEWS - RESIDENTS HAVING NO RESPONSE TO TWO LETTERS TO VALERIE WATTS OF DERRY CITY COUNCIL CONTACTED MLA & CLLR PAT RAMSEY TODAY 10TH AUGUST 2010. PAT HAS ASSURED RESIDENTS REPRESENTATIVES PAULINE MELLON & PHIL MULDOON THAT HE WILL HAVE A MEETING ARRANGED WITH MS WATTS FOR THIS WEEK TO ADDRESS RESIDENTS CONCERNS. GOOD ON YE PAT! HAVE WE FOUND THE ONE DECENT POLITICIAN ON THE CITYSIDE? TIME WILL TELL! assaulted after he challenged a gang of thugs trying to break into his daughters house. He was badly beaten a gang that even used iron bars. As this page is visited by people from Galliagh we would urge everyone to keep an eye out for their neighbours, this attempted break in and the assault happen at approx 6pm, during the day. THIS CANNOT BE ALLOWED TO CONTINUE! STAND UP FOR YOUR COMMUNITY. The site opposite the White Chapel. The Site at the 'end of the runway' behind Knockalla. Moss Road, Above St Paul's Primary School opposite Fergleen (Bloomfield/Altcar). WILL THESE DEVELOPMENTS AFFECT YOU? HAVE YOU BEEN CONSULTED? The purpose of this site to raise awareness of an ongoing campaign by residents in the Galliagh area of Derry to have a full and meaningful input into proposed developments for their community. We cannot state enough that we are NOT against development, however what type of facilities and where they are situated should be acceptable to the local community. 'It stands to reason that the opportunity to create facilities in our community may not come along again in the foreseeable future, so this must be done right, it must be inclusive and it must be a 'bottom-up, community led approach' one that we have ownership of, that we can say as a community 'this is ours'. it would seem that the groups involved are not interested in what the community has to say, yet they claim to operate in our name, and to represent our wishes and aspirations. When hearing of the faced by the community people have said 'why don't you go to your local councillor for support'. If it was only that easy! There are 5 Derry City Councillors representing our Area, Tony Hassan is a member of the Galliagh Development Trust Board, Elisha Mclaughlin is a member of the Outer North Board and was a paid employee of the Galliagh Development Trust, Mary Bradley Councillor & MLA is a member of the Outer North Board, The Mayor Colm Eastwood is a member of the Galliagh Development Trust Board, and finally Councillor Shaun Gallagher is a member of the Outer North Board. So how can residents ask their councillors for help? The agencies involved include Derry City Council, The Outer North Neighbourhood Partnership and the Galliagh Development Trust. If you would like more information just get in touch! The photo on the left is dedicated to the only lawyer in the house. You know who you are! AFTER THE RESIDENTS LEGAL AGENT ADDRESSED THE CITY COUNCIL A COUNCILLOR SAID THAT DIFFERING LEGAL ADVICE HAD BE GIVEN. THE CITY SOLICITOR DECLARED HE WAS THE ONLY LAWYER HERE, A TAD INSECURE OR WHAT? Click the image above (left) to see if you will be affected! Cllr Tony Hassan has a letter in todays journal pointing out what he sees are flaws in Eamonn McCanns article. residents have already responded, pointing out the flaws in Tony's letter! 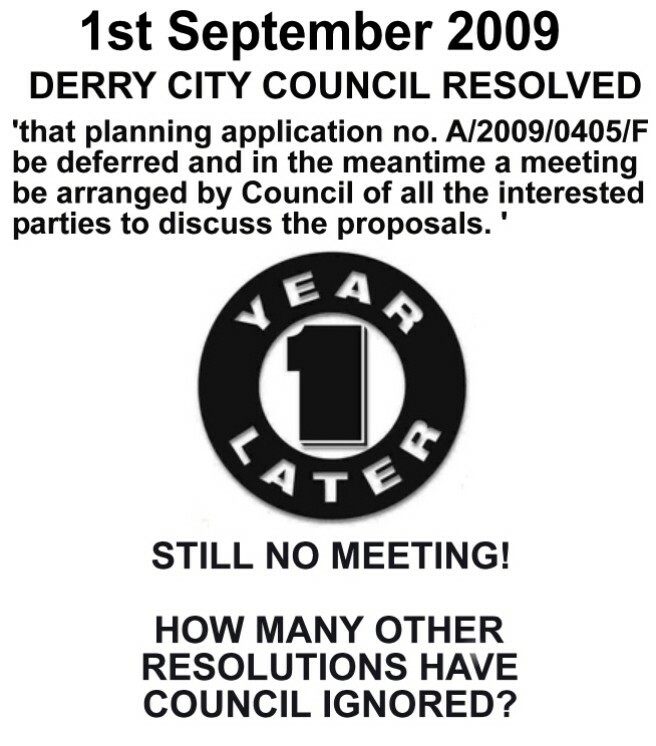 On September 1st 2009 at a City Council planning meeting Councillors stated that as the planning applicant Derry City Council had a responsibility to ensure proper consultation. When asked why the meeting of all interested parties to be arranged by the Council never took place Valerie Watts Town Clerk & Chief executive in a letter to residents said ‘ whatever that was to have meant precisely’. By November the Council denied they were the applicant, and said that this project was nothing to do with Derry City Council. Despite the evidence to the contrary. Council say this is an Outer North Neighbourhood partnership project. So not only are the Outer North saying that they are not the applicant/promoter. They are saying that Derry City Council are represented on the Board of the Outer North. So this makes Derry City Council's denials even stranger, they've done all the work, all the planning and funding applications are in their name, the land was transferred to Derry City Council, they are represented on the board of the Outer North. But this has nothing to do with Derry City Council. Does the right hand of Derry City Council know what the left hand is doing? Then to compound matters further the Department for Social Development who gave Derry City Council £250,000 pounds for this have stated that Derry City Council are the promoter and decision to proceed or not rests with Derry City Council. Now if you're giving someone a quarter of a million pounds you are gonna make sure they are responsible and accountable for the money. 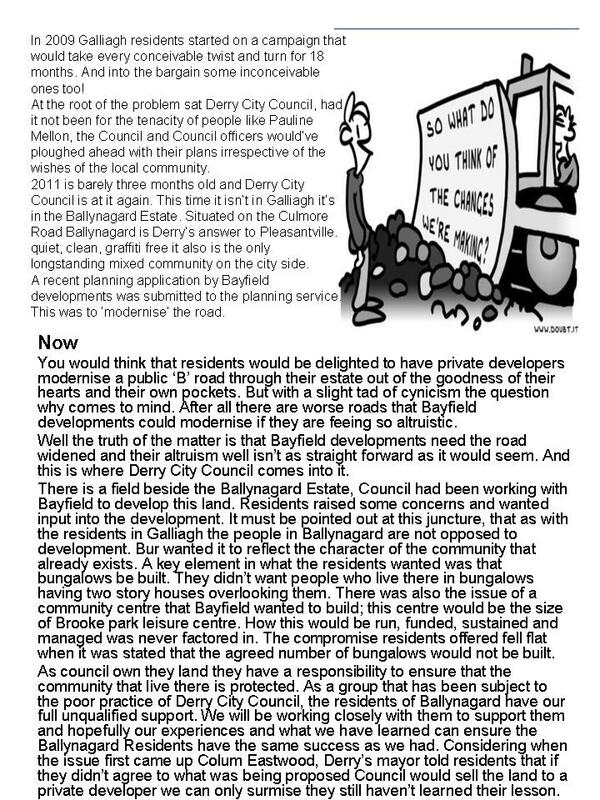 As the holder of planning permission Derry City Council are the only group who can come to a compromise with residents. 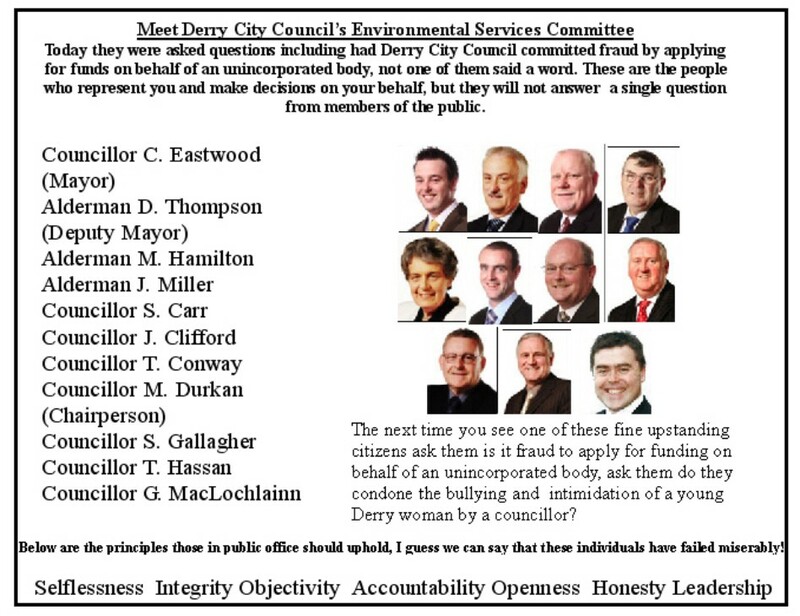 CAN YOU TRUST DERRY CITY COUNCIL? The ‘face men’, the GDT were behind the last summers Holywell consultation, consultation after plans had been submitted is not meaningful consultation. It was after these consultations took place that council agreed that proper consultation had not taken place. The GDT project manager told residents that the development in terms of planning was ‘a fiasco of the highest order’. The GDT have been working in partnership with the Housing Executive on the plans for Galliagh and Carnhill. We all agree that there is a need for social housing & facilities . But we take the view that any development should compliment the existing community and take into account the wishes of the people who live here. The GDT have a current consultation happening with a small hand-picked group of residents making plans for the community. We refused to get involved because we feel that the entire community should be given an equal say into development and that No plans should be drawn up until the entire community is consulted first. We would ask who are the Galliagh Development Trust accountable to? When residents asked last year to meet with the Outer North Neighbourhood Partnership they refused to meet with them. The Outer North set up a ‘working group’ after the council was to arrange a meeting of all interested parties and arranged their own consultation. This group excluded residents from this group and told them had been excluded because they had objections to parts of the proposed developments. No minutes or records of attendance were kept by the ONNP this is in violation of the ONNP general terms & conditions. 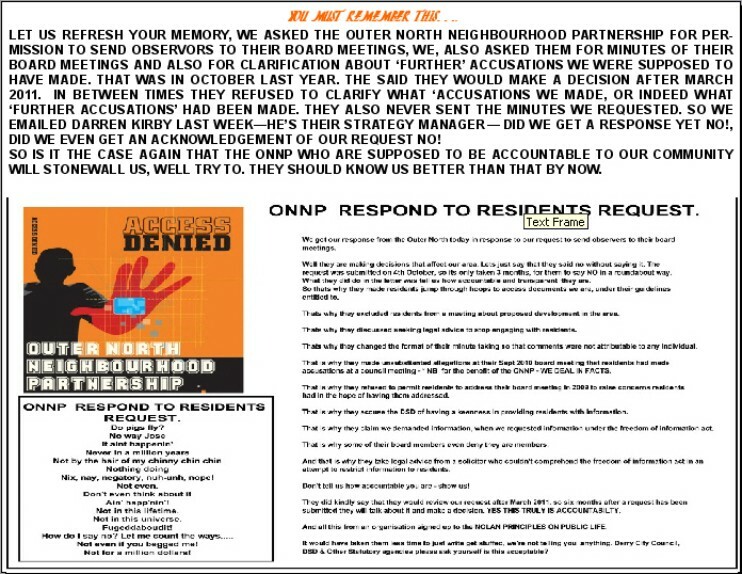 To try and get some clarity residents sent requests to the ONNP for information. The ONNP didn't answer. Residents then requested information under the freedom of information act. 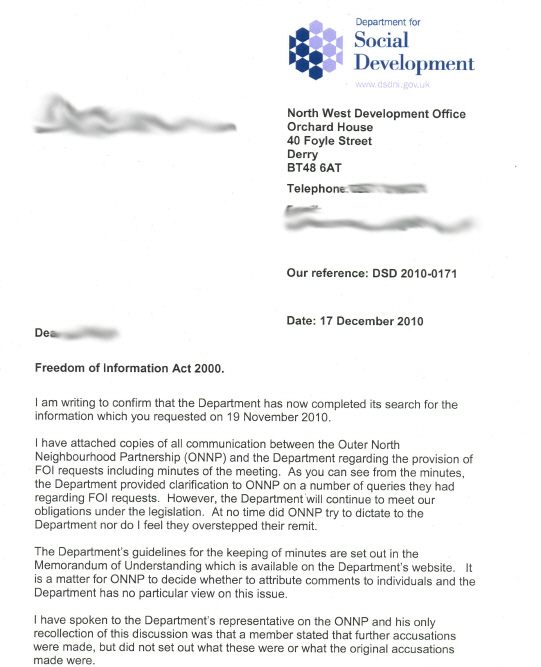 The Outer North didn't respond after giving over the 20 working days as stipulated in the freedom of information act and still no acknowledgment that they had even received the request residents informed the ONNP that they would refer the matter to the information commissioner. It was only then the ONNP eventually told residents that they were not covered by the act. What they did not tell the residents was that under their own rules they were legally required to give residents information. When residents finally got information they found out for following the correct procedure to get information under the freedom of information act the Outer North Accused residents of Demanding Information, and Threatening to go to the information commissioner. This group are helping draw up plans for your community! Who are the Outer North Neighbourhood Partnership accountable to? DERRY CITY COUNCIL TO ACKNOWLEDGE THEIR ROLE AND WORK WITH THE ENTIRE COMMUNITY TO ENSURE FACILITIES FOR EVERYONE IN GALLIAGH. 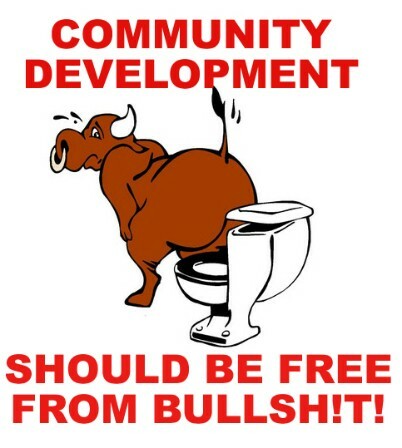 FOR UNELECTED GROUPS MAKING PLANS FOR THE COMMUNITY TO BE HELD ACCOUNTABLE TO & BY THE COMMUNITY FOR THEIR ACTIONS. FOR FULL COMMUNITY WIDE TRANSPARENT AND MEANINGFUL CONSULTATION TO TAKE PLACE BEFORE ANY PLANS ARE DRAWN UP OR SUBMITTED. Residents in the Galliagh area of Derry lodge 20 formal complaints against Derry City Council with the Northern Ireland Ombudsman. 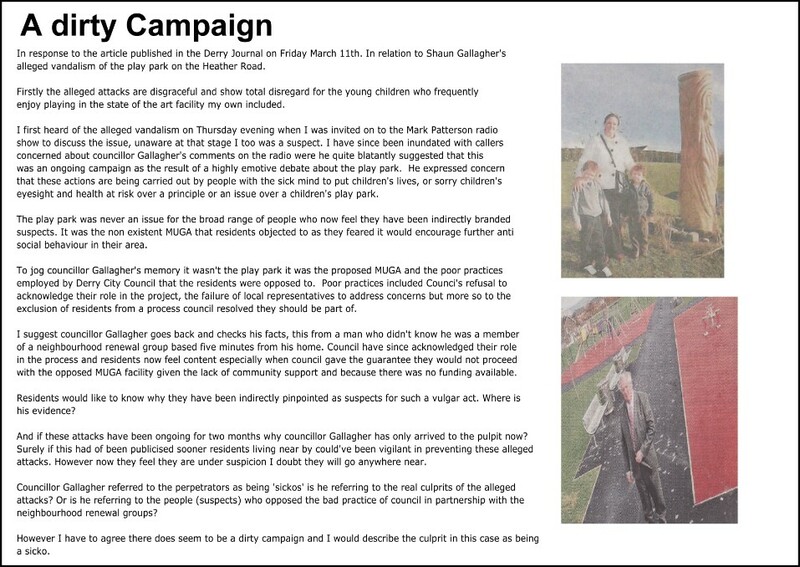 Last year residents of Elaghmore Park and Ederowen Park in the Galliagh area of Derry found out that plans were underway to develop a play park and a floodlit MUGA (Multi Use Games Area) on land adjacent to their homes. Residents welcomed play facilities for children, however had concerns and reservations about this floodlit facility on their doorstep. 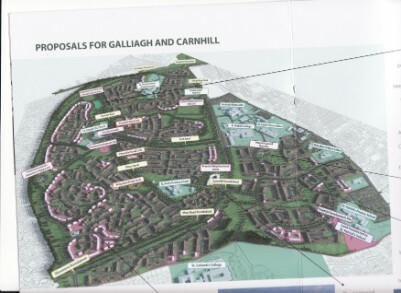 The plans for these developments were purported to be led by an organisation called the Galliagh Development Trust. However documentation obtained by residents prove this is a Derry City Council Project. In late July 2009 some residents were informed by a flyer through their doors that a consultation was to be carried out. Other residents only found out about the consultation through adverts in the papers on the day of the first consultation. This 'consultation' took place after Derry City Council had requested the transfer of land from Northern Ireland Housing Executive, had plans drawn up, submitted and paid for a planning application. Within a week of this process, and before any report was released based upon the outcomes of these so called consultations Derry City Council had submitted a funding application to the Dept for Social Development for £250,000. This report into this ‘consultation’ commissioned by the Galliagh Development Trust was not presented to their board until 24th September 2009. This was two months after funding was applied for, and begs the question of what worth was this consultation if Derry City Council felt it was acceptable to apply for funding before the process was completed. After residents addressed the city council planning committee on Sept 1st 2009, Derry City Council agreed that proper consultation had not taken place and resolved to arrange a meeting of all interested parties. Derry City Council reneged on this and no meeting ever took place. Since the onset of this process residents have been stonewalled, threatened, demonised, suffered emotional blackmail and had to try and cut through misleading and inaccurate information disseminated by organizations including Derry City Council. 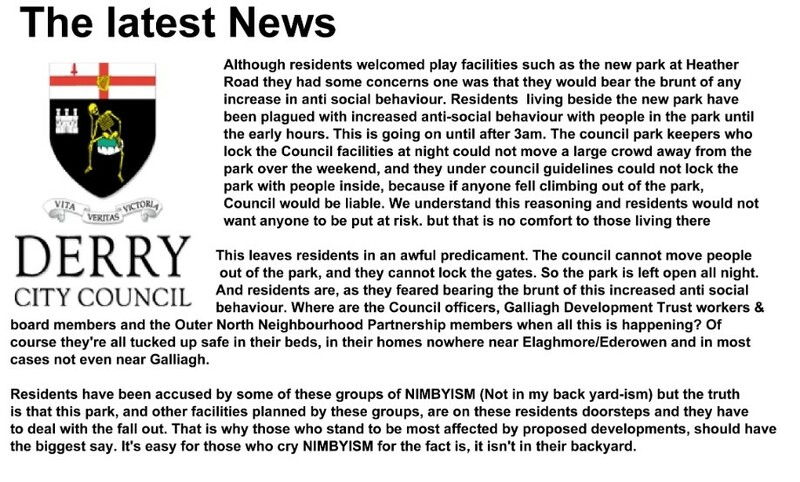 Although the core of this complaint stems from the issue of the contentious floodlit MUGA facility, which sadly has never been satisfactorily resolved, residents believe that there are major issues at hand that go beyond the debate surrounding facilities in Galliagh. There has been a lack of meaningful consultation. There has been a complete lack of accountability. There has been a complete lack of transparency. 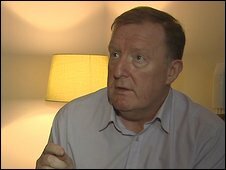 Derry City Council has been dismissive of resident’s views. Derry City Council has used emotional blackmail to push this project through. The decision to lodge official complaints with the Ombudsman’s office was not an easy one to take. Residents made attempts to bring this matter to a positive resolution through discussions with councillors, during these discussions we did inform them that although this was an avenue we would rather not have to take, it was a viable option open to us. What saddens us further is that at a time when Derry City Council pushed for the City to win the City Of Culture award, citing creativity as a core pillar of the bid, they could not be creative and forward thinking when it came to dealing with issues raised by some of their citizens. Residents have serious concerns about the processes employed by Derry City Council and after trying unsuccessfully to persuade Derry City Council to work with residents in an attempt to reach a positive conclusion amenable to everyone involved we feel that we have option but to ask the Ombudsman for his assistance. Galliagh Residents initial complaint to the Ombudsman was covered on the BBC Radio Foyle Sarah Brett show Click play below to listen.